Mining twitter has evolved a lot over the last few years with many more mining sector executives, analysts, and investors starting Twitter accounts and posting regularly. Way back in the bear market doldrums of 2015 there weren't many mining peeps on Twitter, and there certainly weren't many accounts that posted any analysis of real value. 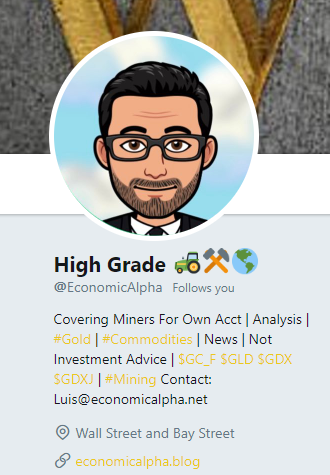 In that barren wilderness of 2015 mining twitter I came across an account that stood out from the rest because this guy took his mining stocks seriously and posted nothing but value-added content. Goldfinger: We spoke last summer in your first ever interview, and a lot has happened since then. Why don’t you tell us about your new blog and what some of your plans are in terms of sharing your mining analysis with a wider audience? Economic Alpha: I established High Grade by Economic Alpha which is basically economicalpha.blog. What I really want to do is expand upon the Twitter platform because on Twitter we’re limited to a certain number of characters. It felt like it was the logical next step for me on the way to potentially having a premium service that I would charge subscribers for. The blog will remain free and I will continue to share ideas and content there from time to time. I really just wanted to see how many people would be interested in reading my longer form thoughts & ideas. Goldfinger: Sounds great. I know I have enjoyed your blog so far and you’ve had some good content including a post about Atlantic Gold and the GDXJ rebalancing. As a blogger myself I find that writing helps me to learn and reinforce ideas that I may have. Blogging is a valuable part of my investment process. Economic Alpha: Another thing I should add is that the blog was sort of bestowed upon me by my followers who sort of forced me to put something together. I regularly get 10-12 private messages a day asking me about various market related questions and I respond as soon as I can. So I have really good user engagement and I was getting a lot of feedback that people really liked my ideas and wanted to follow my process and ideas more thoroughly. Goldfinger: You’re a unique person on Twitter because you’ve been on Twitter for as long as I can remember and you’ve shared your ideas & analysis freely. Moreover, your analysis and investment ideas have been quite thorough and we’ve seen a few of them (like Kirkland Lake and Wesdome) evolve very nicely over time. I also feel like you’ve been really authentic and candid with your posting. I’ve noticed on bad days you’ve shared that you weren’t feeling very good, and on good days you’ve also shared some of your joy and gratitude. You come across as a real person who may not always get it right, but at least we know you’re doing your best and you’re going to call it like you see it. Economic Alpha: Thank you, I really appreciate those kind words. I come from a humble background and when I first started Twitter I had a few hundred followers. My style on Twitter has evolved over the years and now i’m approaching 10,000 followers which is pretty remarkable. I just want to stay true to who I am and share my process authentically. I’ll be honest, I’ve had some big losses over the last couple of years and I’m always trying to learn from what went wrong. I don’t just share my biggest winners, I share it all. I want people to be able to see a real person who happens to be investing & trading in a very specialized niche sector of the stock market. I want to be able to break things down to a level that the average person can follow. You don’t need to be a mining engineer or a geologist to understand how I write and explain my investing ideas/analysis. Goldfinger: That’s fantastic Luis and I think it’s so desperately needed in the mining sector. I think there’s always more room for authentic individuals who bring a lot of value to the table. The mining sector, especially the junior mining sector, is a really opaque ‘backwater’ sector that has largely been neglected. The quality of analysis in the junior mining sector is often of a much lower quality than what we might see in other stock market sectors, and there are a lot of things that are misunderstood (or not understood at all) in this sector. Another challenging aspect of the mining sector is that there are so many different angles to analyze the sector from and everything matters (macro trends such as the gold price, and micro stock specific analysis such as the jurisdiction of a company’s projects). It’s important to have some knowledge and understanding of all the factors that can potentially impact a mining company, however, it’s also important to have some expertise in a couple areas that can set ones analysis apart from the crowd (such as economic geology, mine engineering, or financial accounting expertise). Economic Alpha: Personally the way i’ve always looked at mining stocks is before you get into any deep due diligence eliminate the price of gold and what it may or may not do in the future. That will remove presumed internal gold bias out of the equation. Then, I think it’s important to evaluate all the risks up front. So before you get into any further due diligence you want to A) Eliminate the price of gold in your analysis or use realistic prices B) Evaluate all the potential risks up front. I think if you approach mining investments in this manner you will be leaps and bounds above everyone else. So many people like to use extremely high gold price forecasts in their analysis, however, at the end of the day in my world a mining company is selling a product at a margin and it’s the margin that matters. If that margin is great today imagine at higher gold prices? They could be selling boxes, envelopes, whatever. It just so happens that they’re producing gold and we shouldn’t lose sight of the fact that the point of the business is to make money, not produce the most gold. Goldfinger: I think that’s a great point, if a mining company can’t make money at current gold prices then why would I want to own them? More importantly, an investor should evaluate the risks in owning a mining company and one of the biggest risks that’s always a possibility is a decline in the price of gold. Investors should probably think of a rising gold price as the icing on the cake, but it shouldn’t be something that one counts on. Why don’t you tell us about a couple of your favorite picks right now? Most of us are probably aware of Kirkland Lake Gold (NYSE:KL, TSX:KL) and how well you nailed that stock. Economic Alpha: As you mentioned KL is a well documented story and both the story and the company’s share price have matured considerably since I first started tweeting about it in 2016. Wesdome is another well known play of mine that I started really pounding the table on around C$2.00 last May and I’ll just say that Wesdome is now in a “show me stage”. Wesdome shares are down about 20% from their highs of a few weeks ago but the stock is still more than a double in the last year. Wesdome needs to follow-up with Kiena results that are pretty good, in particular up plunge extensions, in order to continue its strong ongoing momentum. Atlantic Gold (TSX-V:AGB) is another stock that i’ve highlighted and it is up nearly 40% year-to-date. There is another company that I haven’t talked as much about and that is SSR Mining (Nasdaq:SSRM, TSX:SSRM). SSR bought out Claude Resources in 2016, and they now operate the Seabee Mine which is a very high grade mine in Saskatchewan. I like SSR in this environment. They’ve done a great job of operating the Seabee Mine since they took it over from Claude Resources in 2016; they’ve extended the mine life and have increased production. They also operate the Marigold Mine in Nevada which produces ~200,000 ounces of gold per year. I like the story because they have a great organic growth story which could bring down the cash cost per ounce of production by ~$200 in the next couple of years. Capex is also coming down from peak levels which means free cash flow and profits are about to start cranking higher. Goldfinger: I love when the fundamentals & technicals are in alignment. Let’s go back to the basics on SSR again. How many projects does the company have? Economic Alpha: So they have the Marigold Project in Nevada, the Seabee Gold Mine in Saskatchewan, and then they’ve got a joint venture down in Argentina (75% SSR) that’s going to produce 6-7 million ounces of silver this year. So if you add it all up and use gold-equivalent ounces for the Argentine assets, SSR is close to 400,000 ounces of gold production per year. And that’s expected to grow. Goldfinger: And what’s the SSR market cap right now? Economic Alpha: After the recent drop it’s about US$1.5 billion. They also have about US$420 million in cash and convertible debt outstanding of US$250 million. SSR has what I view to be one of the cleanest balance sheet when compared to other mid-tier profiles and their capital structure and share structure is simple. Goldfinger: What kind of exploration upside do you think SSR has at its 3 main projects? 400,000 ounces of annual production is nice but at a US$1.5 billion market cap it’s not exactly cheap unless they have some additional upside. Economic Alpha: Yes, there is ongoing exploration at Marigold and in fact some exploration success there could be what brings the production from 200,000 ounces to 300,000 ounces per year. There is an economic study ongoing at Marigold and it should come out at some point during the 2nd half of this year. Seabee continues to see high-grade gold hits and SSR continues to increase their reserves and resources there. I can envision a scenario in which SSR ramps up to 500,000 gold-equivalent ounces of annual production in the next few years organically. SSR also has a portfolio of exploration/early stage assets in Mexico but I’m not counting on any of those to be successful in my valuation analysis. If SSR does get lucky with any of those it will just be icing on the cake. Goldfinger: What are the downside risks that you see in SSR? Economic Alpha: The one negative I would highlight is that SSR has always been an acquirer. They’ve done several acquisitions in the past including buying the Seabee Mine with acquisition of Claude Resources, however, their acquisitions have always been accretive. SSR has recently taken a 10% interest in Silvercrest, and Silvercrest has been doing really well so I think the market thinks SSR might make a move on Silvercrest at some point down the road. I’m comfortable with SSR being acquisitive because the last two deals they’ve done generated value well above the purchase price. To me it’s all about execution and SSR has a track record of strong execution. Goldfinger: Going back to Atlantic Gold, do you still own shares there? Economic Alpha: Yes I do. Goldfinger: What are your thoughts on Atlantic here and how much upside do you think is still available? AGB has had a nice run the last few years. Economic Alpha: Atlantic just put out a resource update at MRC (Moose River Consolidated Project) - they have an in-pit mine resource of 2.1 million ounces. The big news will be coming up in the next couple of weeks and that is the life of mine update which will incorporate the new resource update and recalibrate everything. The stock has had a nice run of late but I think they’ve got something special going for them in Nova Scotia with a fairly achievable plan to execute. I believe AGB will continue to outperform but we do need to see how that LoM update looks and assess accordingly and will need further exploration success to further sustain and enhance the move. Goldfinger: Last time we spoke you mentioned you don’t play around much in the exploration space, you prefer producers that have some exploration upside potential but you really like having that cash flow to help anchor the valuation. Do you ever take a punt on a tiny explorer that is operating in the same jurisdiction as a mid-tier producer? For example, with Atlantic Gold in Nova Scotia there is a tiny explorer nearby called Osprey Gold. Economic Alpha: I don’t really like the whole “near-ology” concept, I think it works sometimes but I think most of the time it doesn’t. I really want to see significant exploration results before I do anything with a junior explorer. Great Bear Resources (TSX-V:GBR) is an example of the type of explorer that I would dabble in; they’re in a great location and they’ve demonstrated some high-grade intercepts. Osprey is too early stage for me to be interested in. Goldfinger: It’s just too difficult for you to value a pure-play explorer? Economic Alpha: Yes, and I think you have to own a lot of them to mitigate some of the risk. I think this is what Eric Sprott does by owning so many junior explorers, you’ve got to have your hands on a lot of them in order to withstand the losers. You’re probably going to lose on 90% of pure play junior explorers if you just buy and hold. So unless your timing is impeccable you’ve got to own a lot of them to handle the losers and find enough of the winners. You’ve also got to be lucky enough to get in early before the good exploration news starts to come out. Goldfinger: That’s a great point about having good timing in the juniors; not only is it important to cash in some of your chips when you’ve got big gains, but it’s also important to dump stocks that simply aren’t working and take the loss before the loss becomes enormous. Goldfinger: Can you give us some insights into your investment process? How do you formulate a plan for a trade or investment? What tools do you use on a daily basis? Economic Alpha: When I first started I simply used Yahoo Finance and I created a basic portfolio on there. The more experience I got in the mining sector the more robust my mining portfolio became. Eventually it got to the point where I was able to create my own little excel spreadsheet based upon some key factors that I look at like: Location, market cap, and some valuation metrics that I like to look at. I track about 75-100 stocks on a given day and I use CEO.ca Pro Market Depth for the level 2 quotes. I love the intuitive nature of the graphics on CEO.ca and the market depth helps me to place orders. I usually trade Canadian listed miners via their OTC listing in the US and very often the OTC listing either doesn’t have a bid/ask spread or the spread is very wide so I find myself using the CEO Pro Market Depth and making an FX calculation (USD/CAD exchange rate) in order to place buy/sell orders on the OTC market. Goldfinger: That’s really interesting and I think it brings up an important point about the OTC listing for many junior mining stocks - if possible it’s better to trade on the Venture, TSX, or CSE rather than dealing with the illiquidity and market makers in the US OTC markets. You definitely never want to use market orders on OTC listed stocks! Economic Alpha: I think we’ve all learned that lesson at some point and I only use limit orders these days. The level 2 market depth at CEO.ca has helped me a lot on trade executions. Goldfinger: I’ve been preaching the 'CEO Pro gospel' in recent weeks and i’m glad to hear you find it valuable. Economic Alpha: It’s certainly worth the price I pay for it. Goldfinger: Tell us more about your investment process. Economic Alpha: Well it’s definitely evolved over time and it will continue to be refined especially if Gold can break $1400 and sustain. Stock picking would be a lot easier in a bull market. I call my process “underwriting” which comes from my insurance background. If I determine the upside is worth the potential risk that I’m taking then I think it’s a good investment/trade proposition. However, it’s really important to know your downside before you get into anything and the only way to do that is to reconcile the risks up front as the first thing that you do. If I can’t ascertain the risks then I won’t make the investment. Goldfinger: I think that’s a great point. Most novice investors are so focused on the upside that they forget about what could go wrong. We should always focus on the downside first, then once we’ve got the risk under control the upside will take care of itself. Your focus on risk management helps to understand why you mainly focus on mid-tier developers & producers because it’s much easier to quantify the downside risk as opposed to a pure-play junior explorer which could in theory have 100% downside (if they don’t find an economic resource and burn through shareholder capital time and time again). Economic Alpha: I think it’s also important to understand that mining stocks have a terminal value; there comes a point at which they can’t grow their resources anymore and they run out of ore to mine or they’ll have to make acquisitions etc. So you can’t extrapolate “X” years worth of production out beyond realistic mine lives and the discount applied to get present value is important and must be realistic as well. You’ve got to ultimately get a firm grasp of what the realistic production growth potential is for a company and go from there. Another vital metric for me is free cash flow. I don’t want to see a mining company grow their production at all cost. It needs to be sensible and realistic and the IRR and payback for the investment should make sense otherwise you’re just growing production just to grow it and potentially compromising returns and free cash flow in the process. Exploring existing properties is one way to find cheap ounces. Development of brownfields with low capital intensity is another way. Goldfinger: I think that’s an important point. There was a time when senior gold producers were trying to grow production at any cost and it ended up getting them into big trouble between 2013-2015 when the gold price tumbled. Economic Alpha: Yes, this is what got me into trouble with Superior Gold (TSX-V: SGI); it was very cheap and undervalued when I first bought the stock, however, they ended up starting production at a new mine and while their production went up, their costs went up much more. Poor execution followed and ultimately I think this was a big mistake on their part, at least for the time being, and I learned my lesson from that. Higher gold prices can mask operational mistakes but we haven’t had that luxury in a long time. One of the other things I don’t like to see is a very promotional type of management team. I don’t like to see companies using a lot of promotion to get their name out there especially when they don’t have a lot of real news to justify all of the promotion. For example, a company that’s starting a drilling program of maybe 40 holes and they just drilled the first hole and they’re hiring all of these promotional experts to build a bunch of hype around one hole. I question management’s intentions in situations like that. Another thing I like to see is insider buying. It’s not the end of the world if there isn’t much insider buying but I really want to see management that has skin in the game and who are properly aligned with shareholders. Two of the biggest indicators for me in both Kirkland Lake and Wesdome was insider buying: In KL it was Eric Sprott’s relentless buying and in Wesdome insiders were buying hand over fist as soon as the company started to report some high-grade drill results. In Wesdome the insider buying stood out even more because there was very little insider activity in the past. Goldfinger: Final question, how does the fact that the two biggest investment vehicles in the gold mining sector are passive ETFs (GDX and GDXJ) influence the space from a trading and investment standpoint? Economic Alpha: I think it offers a lot of opportunity to diligent investors who are able to identify the real under-the-radar opportunities. People who are able to actively manage their portfolios in an effective way have a big edge over these passive index ETFs. The passive index funds need liquidity generally speaking and they flock to the most liquid ones leaving names like Wesdome and Atlantic underowned. Goldfinger: That’s an excellent point and I think that the smaller retail investor has a big edge because they can move in and out of juniors and mid-tiers without moving the share prices of stocks very much - a lot of the investors in the mining sector simply can’t buy certain stocks because the market caps are too small OR they can’t easily sell positions because they would have an inordinate impact on price. Being small and active is an advantage! Luis I'd like to thank you for your time and candid insights. I wish you all the best and I know i'll be reading your blog regularly.